What's the Difference between Major and Minor Music Scales? Understanding major and minor scales is a fundamental part of creating original music. As you become more familiar with different major and minor scales, you’ll notice that the melodies of popular songs are typically made up of notes in a single scale. The easiest way to distinguish these scales is to remember that major scales sound cheerful or upbeat, while minor scales have a sad or gloomy sound. Although they may seem difficult to learn, each type of scale follows a simple formula. In order to understand scales, it helps to have some basic knowledge of the different kinds of notes. On a piano, the black keys are sharp and flat keys, while the white keys are what we call “natural” keys. Sharps raise the note by a semitone (the smallest musical “distance” between notes in Western music, also known as a half tone or half step), while flats lower the note by a semitone. Natural keys raise or lower the note by a whole tone. The image below depicts the sharp, flat, and natural keys on a piano. Notice the black keys all have two labels— both a sharp (#) and flat (♭) note. This is because the black keys are labeled relative to the white or natural keys that precede or follow them. For example, if I was to play a C major key (the white key on the far left of the diagram) followed by the black key right next to it, we would refer to this key as C#, since it is a semitone higher than C major. However, if I were to play a D major key (the white “D” key farthest to the left), followed by the black key to its left, we now refer to this key as D♭, since it is a semitone lower than D major. It’s the exact same black key as the first example (playing, of course, the exact same sound), but its label varies depending on whether we are moving up a scale (towards a higher pitch), or down a scale (towards a lower pitch). In the image above, you can see that not all of the white or “natural” keys are separated by a black key. The E and F keys, for example, are located directly beside each other. What this means, is that (in basic musical theory at least) E# and F♭ simply don’t exist. This is also the case for B# and C♭. Because of this, the white E and F keys, and the white B and C keys are separated by a semitone rather than a whole tone, unlike the rest of the natural keys. These exceptions to the rule are important, because they help us apply the formulas for major and minor scales described below. Now we can’t string together any old notes and call it a scale; anyone who has tried playing random strings or keys on a guitar or piano knows that this just creates noise. A scale is a collection of notes carefully arranged according to pitch. Pitch is a term used to describe the sound of single notes relative to each other, or the “highness” or “lowness” of a scale. For example, you can play a C major scale on a piano starting at C4 (i.e. middle C), or starting at C5 (the next highest C natural note, located to the right of middle C). In both cases you would be playing the same scale, but at different pitch levels. Scales typically span a single octave. An octave is the distance between one musical pitch and another. An easy way to remember this is to think about the notes in a scale, like the C major scale (C-D-E-F-G-A-B-C). The first and second C in the C major scale are separated by exactly one octave. Most scales in popular genres today have 7 notes per octave. Scales are named for the beginning note, so a C major scale starts with a C major note, a D major scale starts with a D major note, and so on. The most important thing to remember about scales—what differentiates major and minor scales—is that each type follows a unique interval pattern. Intervals refer to the difference between notes, or whether the notes are separated by a whole tone (e.g. C-D) or semitone (e.g. C-C#, D-D♭,E-F, B-C, etc.). The major scale (belonging to a class of scales known as “diatonic”) is one of the most recognizable in music genres today. As a child, at some point you were probably taught to sing “Do-Re-Mi-Fa-So-La-Ti-Do”. What you may not have learned, or may have forgotten, is that these syllables represent a major scale; whether the scale you are playing is D major, F# major, or C major, the melody will sound like Do-Re-Mi-Fa-So-La-Ti-Do. 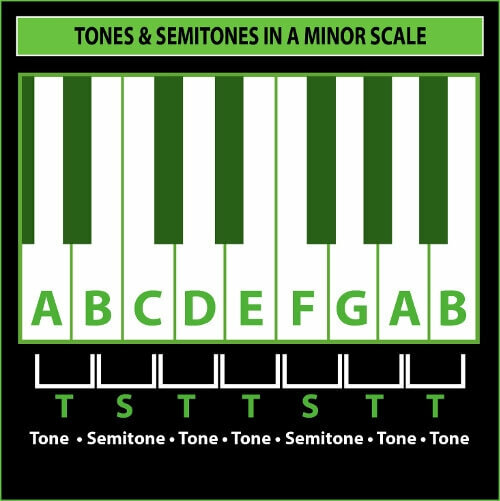 This is because all major scales consist of the same pattern of whole tones and semitones: T-T-S-T-T-T-S (where “T” stands for a whole tone, and “S” stands for a semitone). Following this pattern, we can see that “Re” is a whole tone higher than “Do”, and a whole tone lower than “Mi”; “Mi” is a whole higher than “Re”, but a semitone lower than “Fa”; “So” is a whole tone higher than “Fa”, and a whole tone lower than “La”, and so forth. The example below shows us the difference between a C major scale and a C minor scale. This is where our knowledge of sharps, flats, and naturals (or semitones and whole tones) comes in handy. 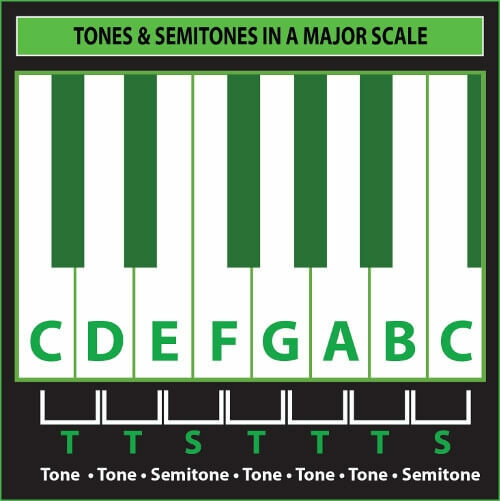 In the C major scale on the left, D is a whole tone higher than C, and a whole tone lower than E; however, E and F are separated only by a half tone. F, G, and A are separated by whole tones, while B and C are only a semitone apart from one another. In the C minor scale depicted on the right side of the above image, C and D are separated by a whole tone, but D and E♭ are only a semitone apart. E♭ and F, however, are separated by a whole tone. The F and G notes are also separated by a whole tone, but A♭ is only a semitone up from G; B♭ is a whole tone higher than A♭, and C is a whole tone higher than B♭. Once you understand major and minor scales, you have all the knowledge you need to compose a melody, which is the first step in writing a hit song. Pretty good article on this topic!